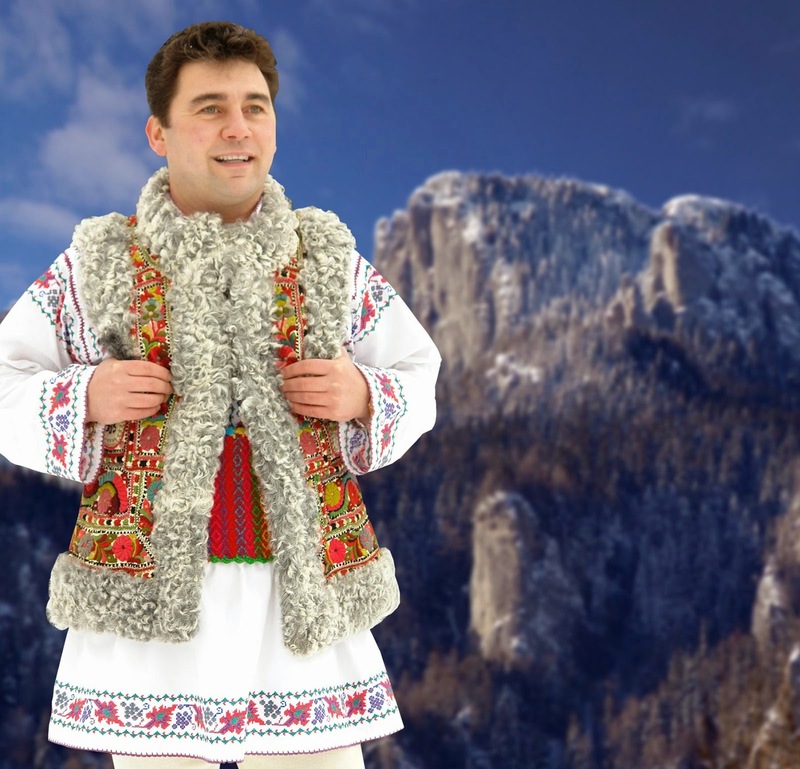 Today I would like to take a look at northwestern Moldavia, the area just south of Bucovina. 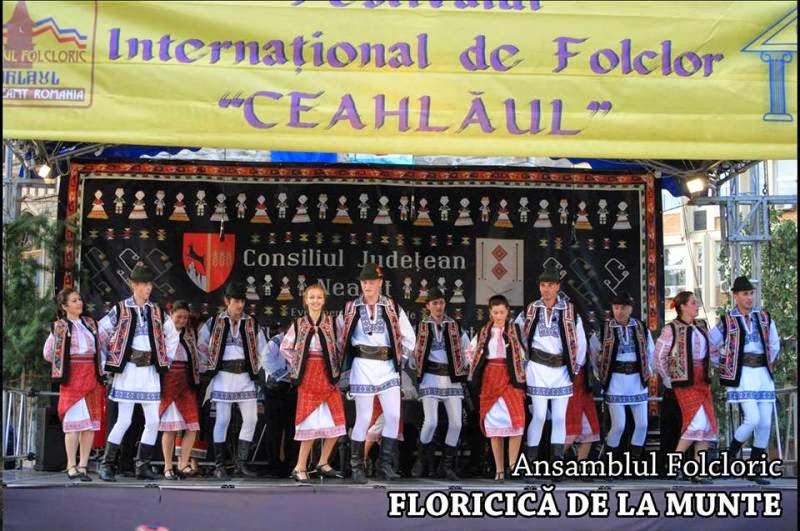 Moldavia, is a region with a rich past, being an independant Dukedom for much of its history. 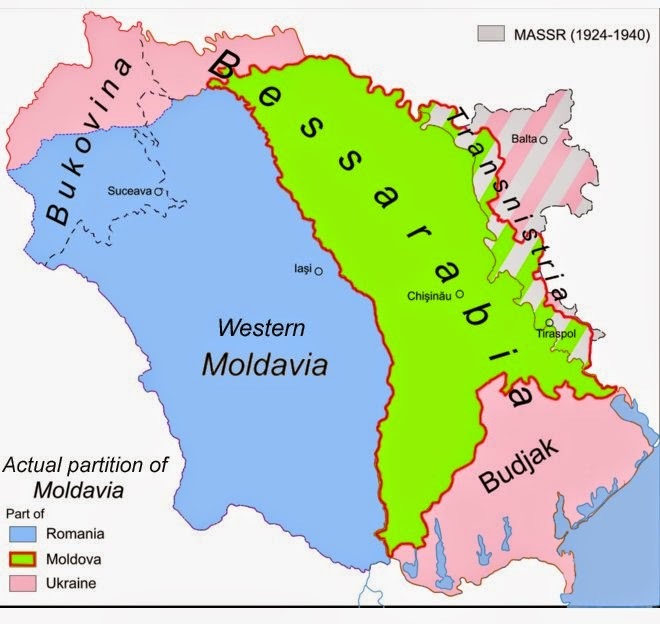 Moldavia basically extends from the Eastern Carpathians to the Dnister River. 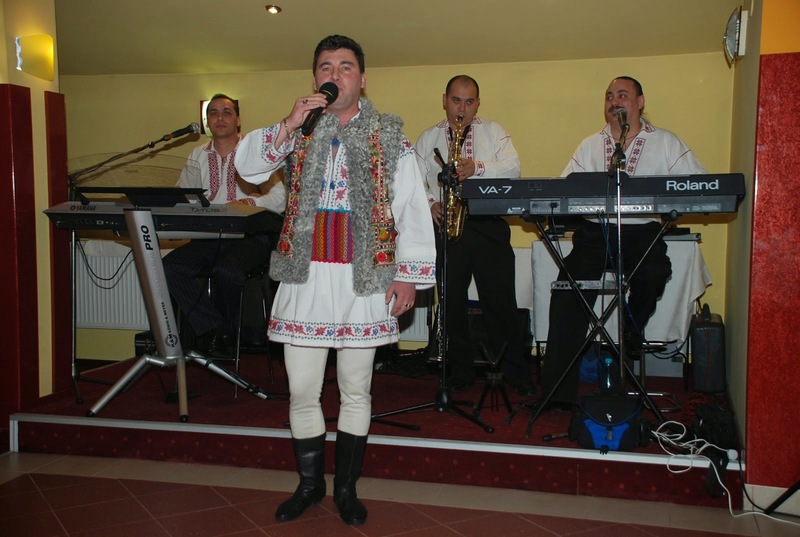 The north and south borders have varied a lot, but culturally would exclude the Danube delta and the areas north of the current Ukrainian border. 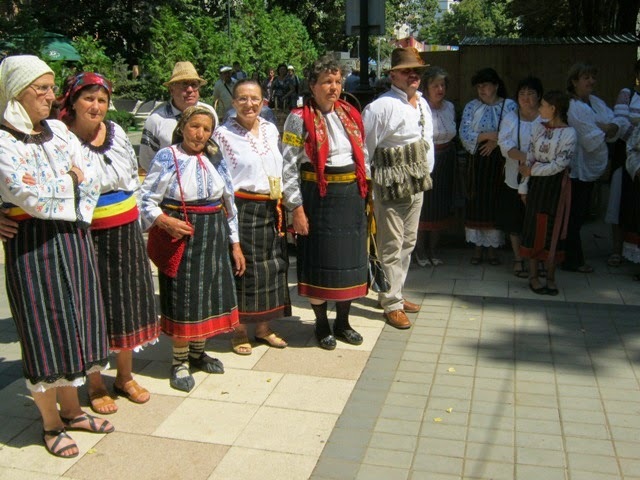 In Romanian, Moldavia is called Moldova. 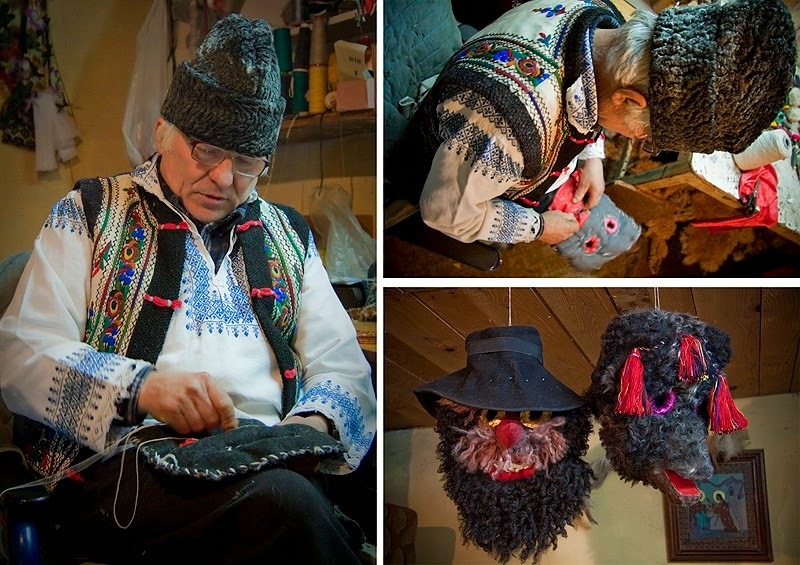 For a couple centuries now, Moldavia has been split in two along the Prut River. 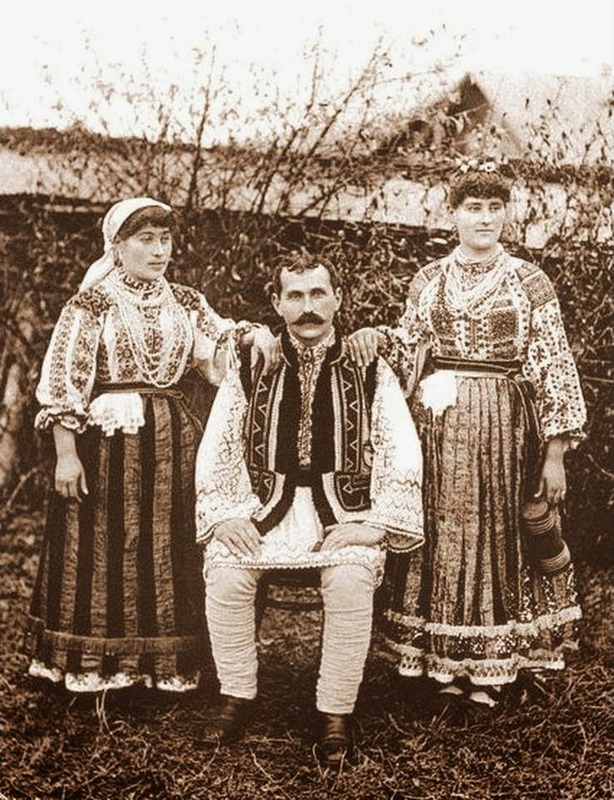 The eastern part, Bessarabia, was annexed by the Russian Empire, then passed to the Soviet Union, and is now independant, but the people there are mostly ethnically Romanian, and speak a minimally divergent dialect of that language. 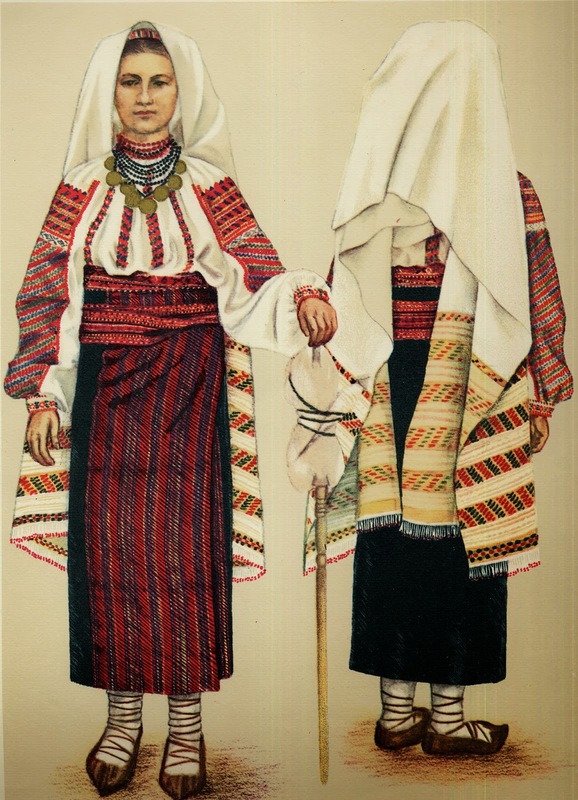 Bucovina, while traditionally distinct, because it was part of the Austrian Empire, is culturally part of Moldavia. 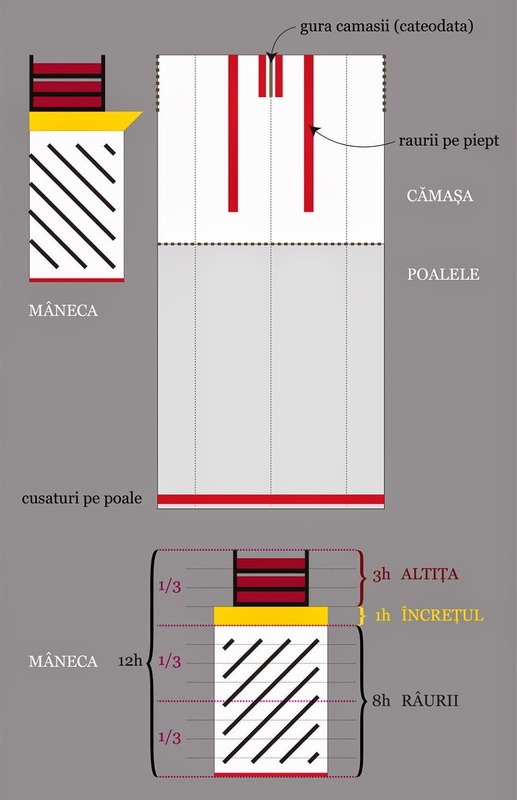 At the head of the article is a print by Alexandrina Enachescu Cantemir, showing a woman in the costume of the Roman district. 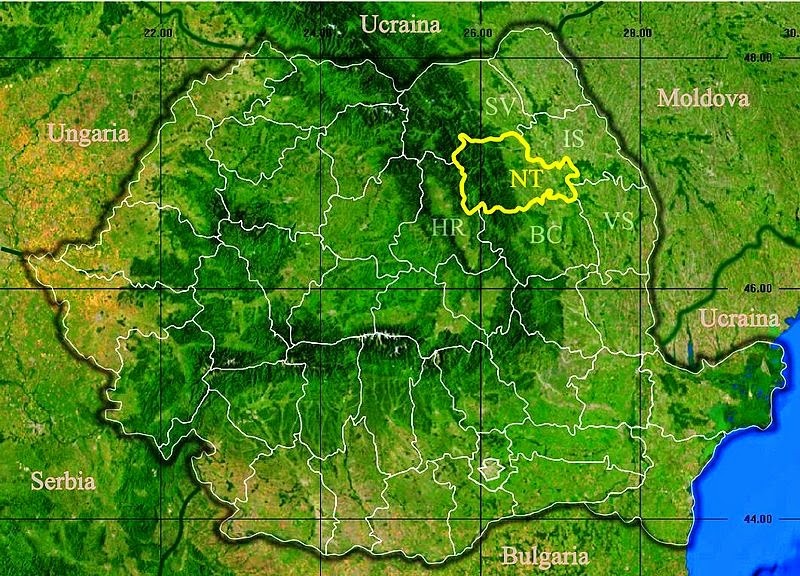 Roman, along with Neamț and the Bistrița valley, form the modern county of Neamț. 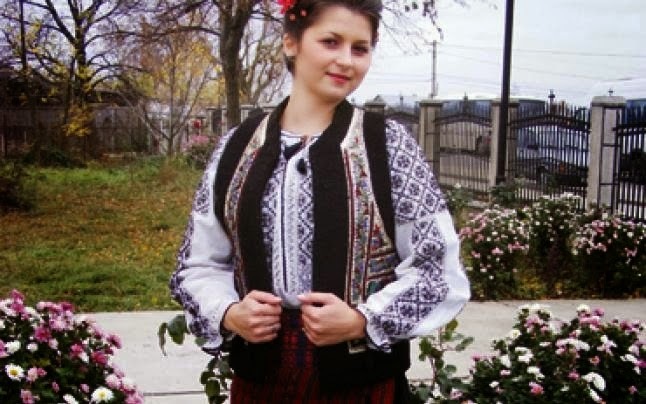 The costume over most of Moldova is similar, consisting of a chemise for the woman, Ie or Camasa, a wraparound skirt, fota or cătrinţă, a sash, and a long cloth worn on the head. 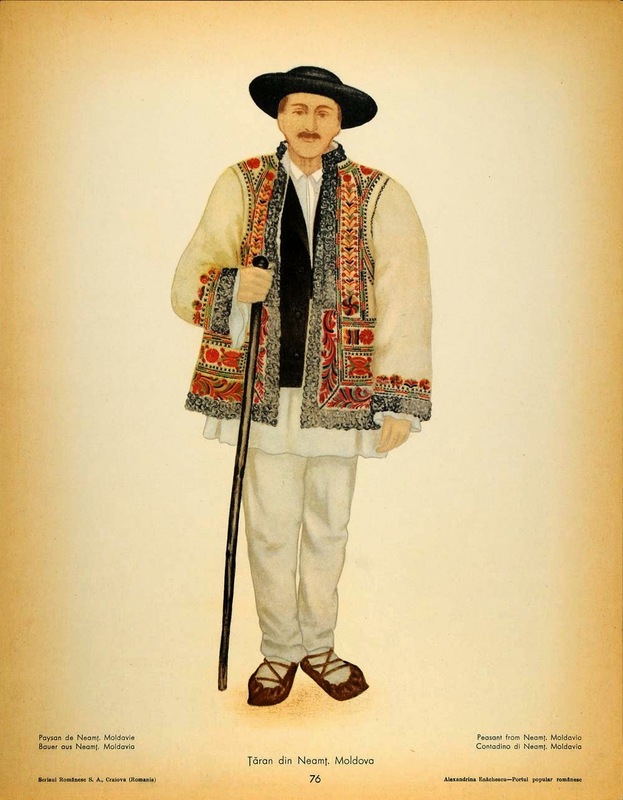 For the men, a tunic, traditionally knee length, although today often shorter, narrow white linen pants, a hat, and a belt or sash. 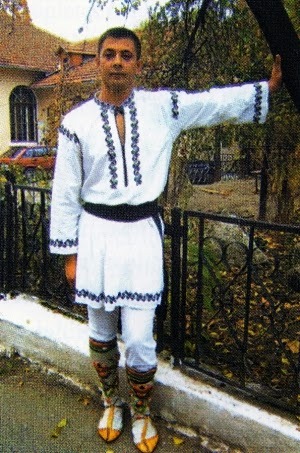 Both wore moccasins, shoes, or boots. 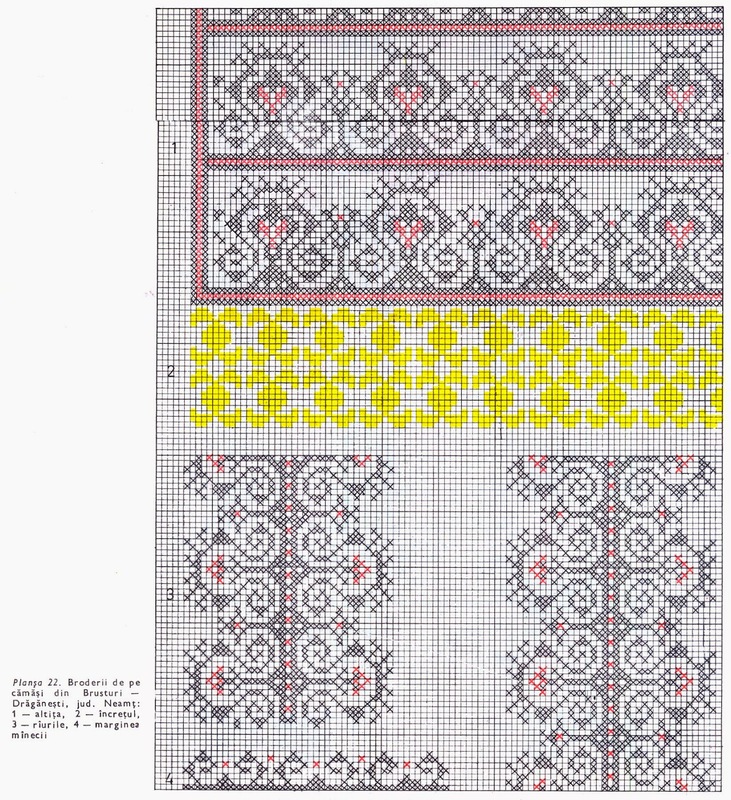 The same two cuts are used for the women's chemises as in Bukovyna. 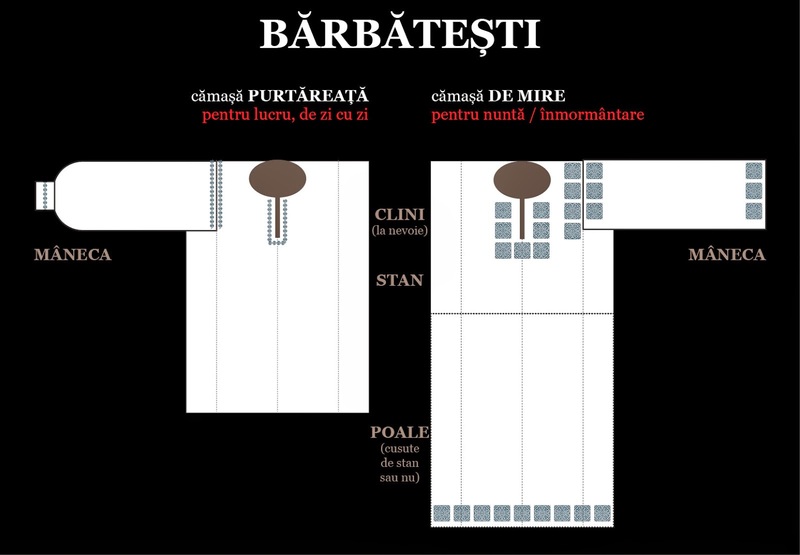 These two cuts in Romanian are ie [gathered] and camasa [boycut]. 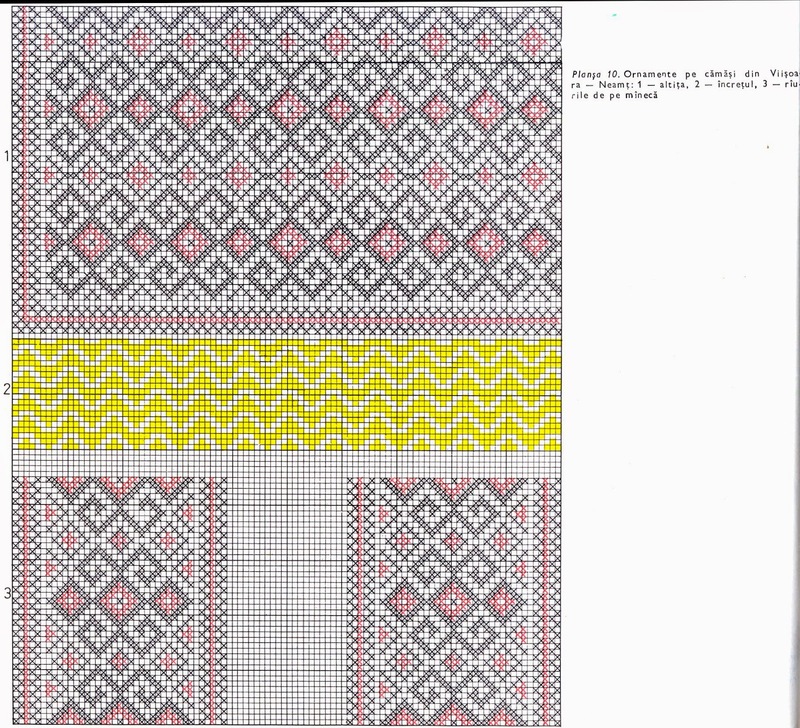 Here is the cut of the ie as given by the blog Semne Cusute. 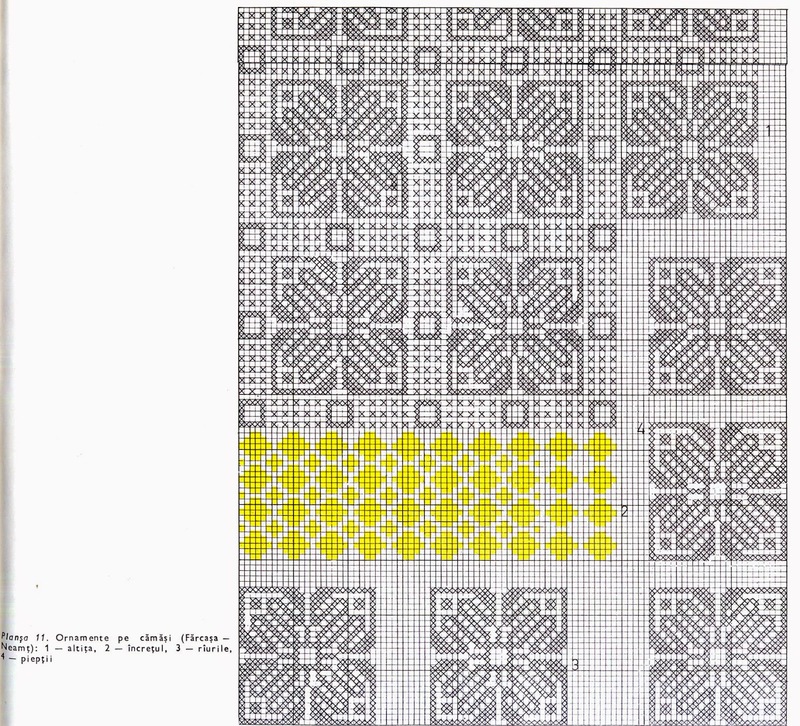 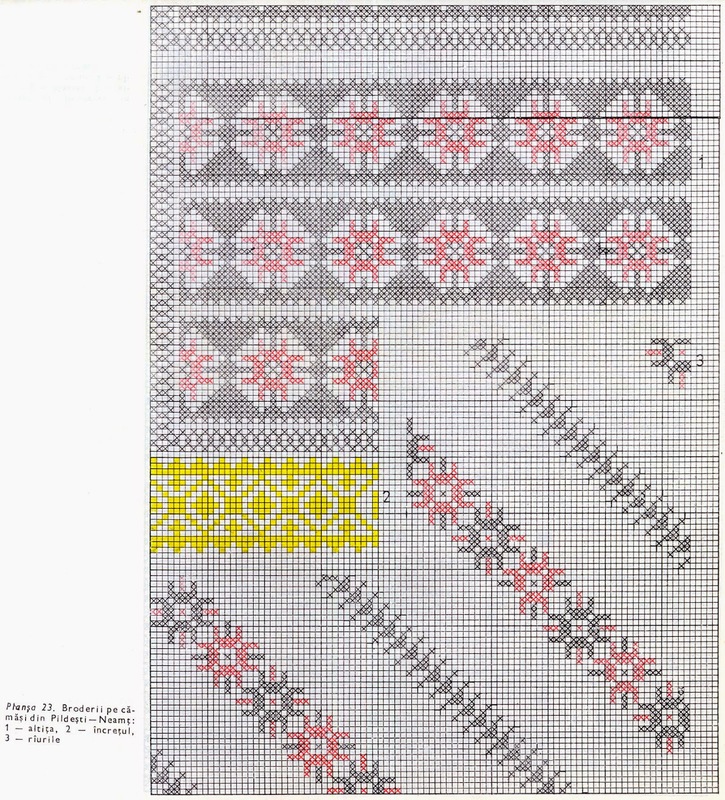 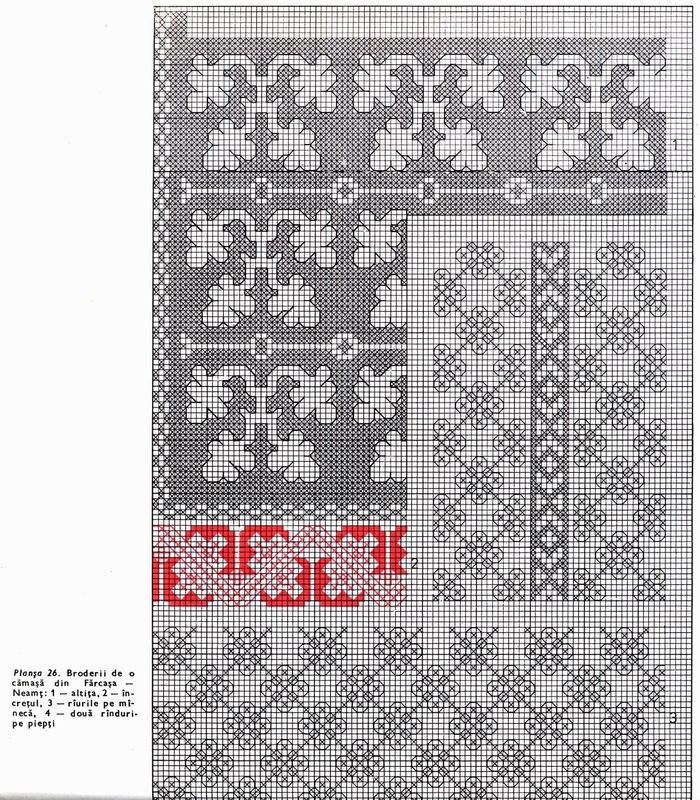 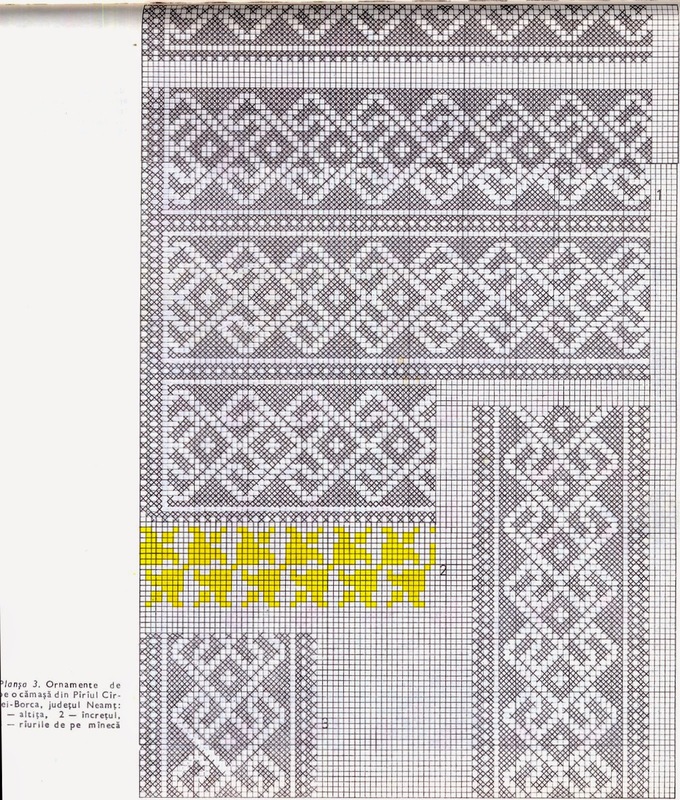 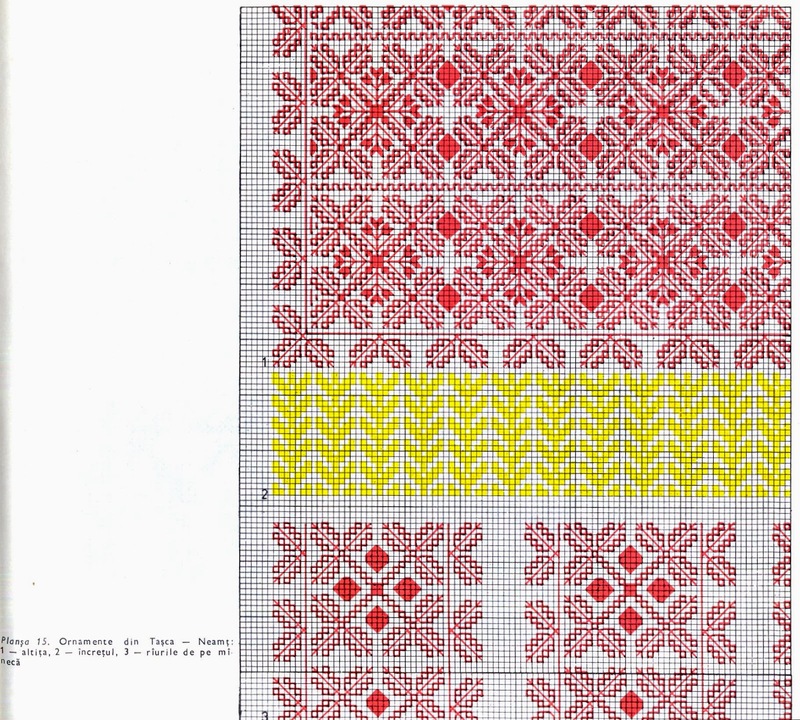 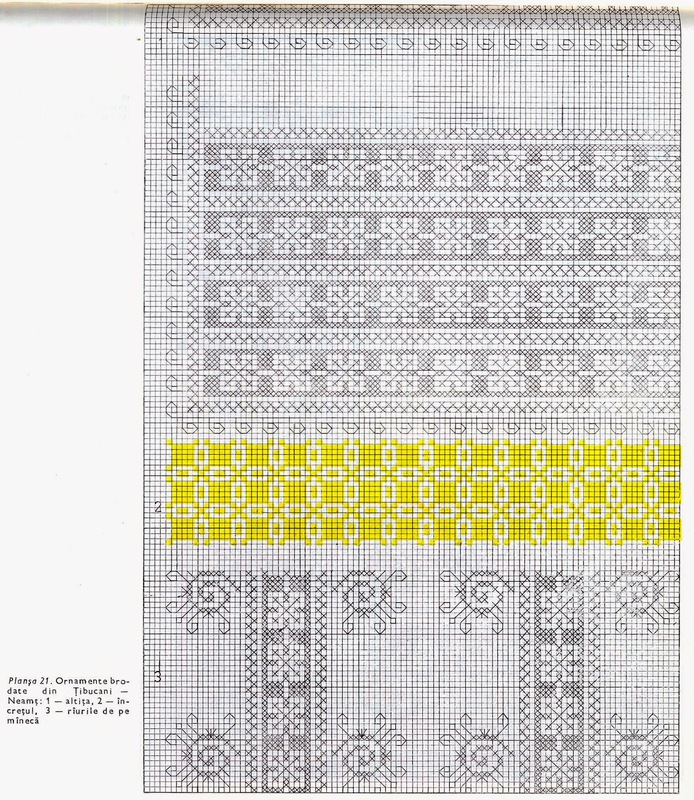 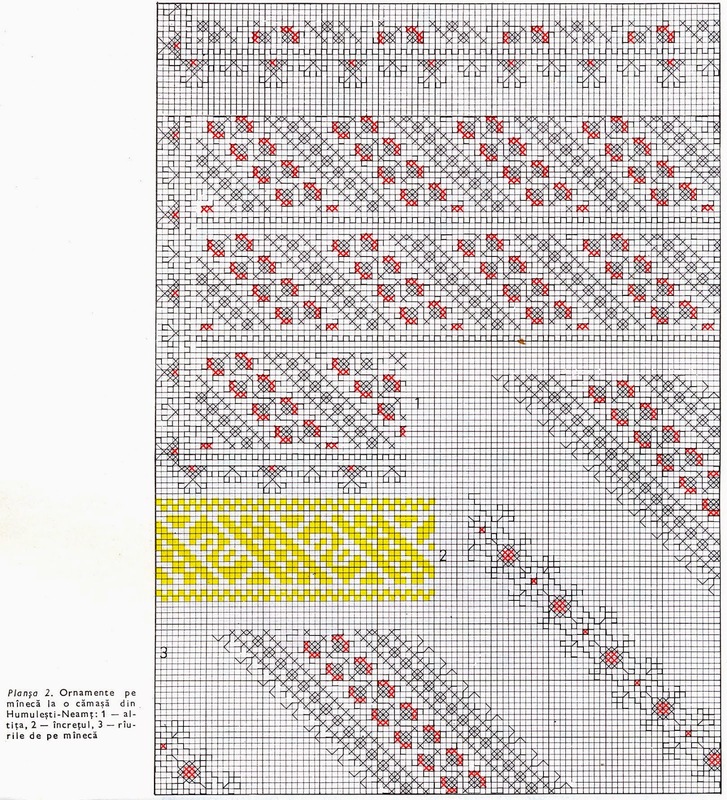 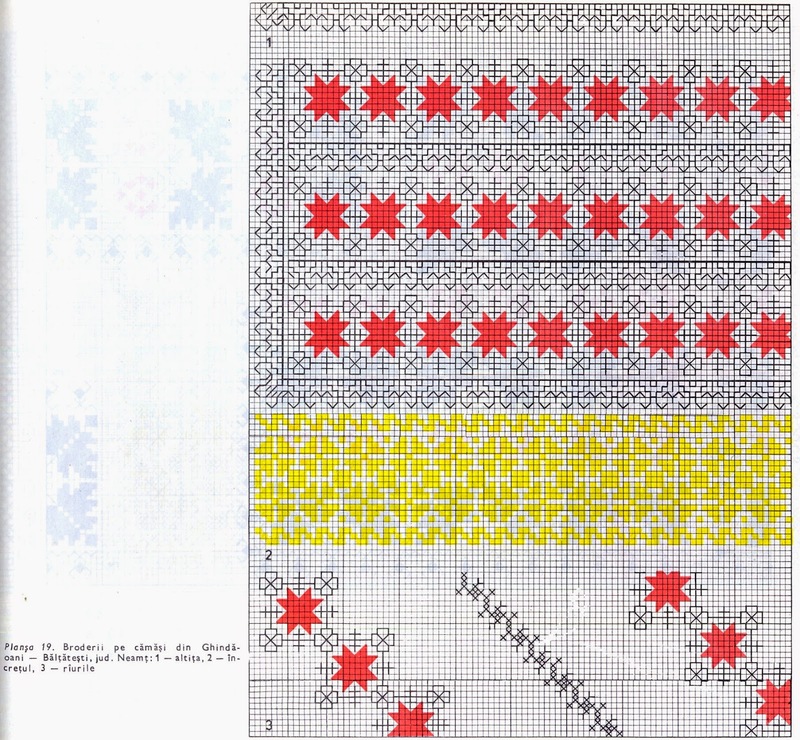 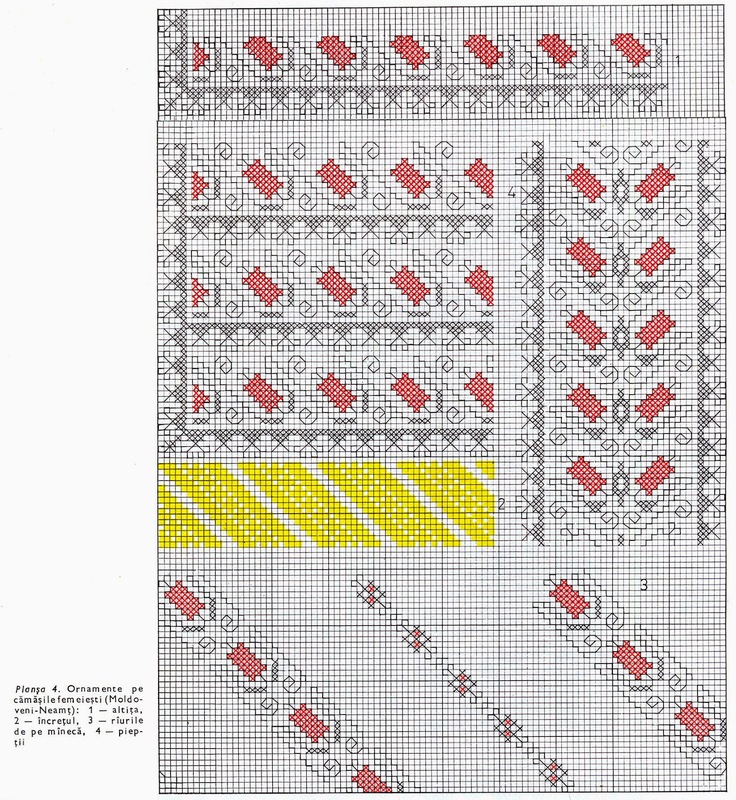 This blog is an invaluable source for those who are interested in Romanian Embroidery. 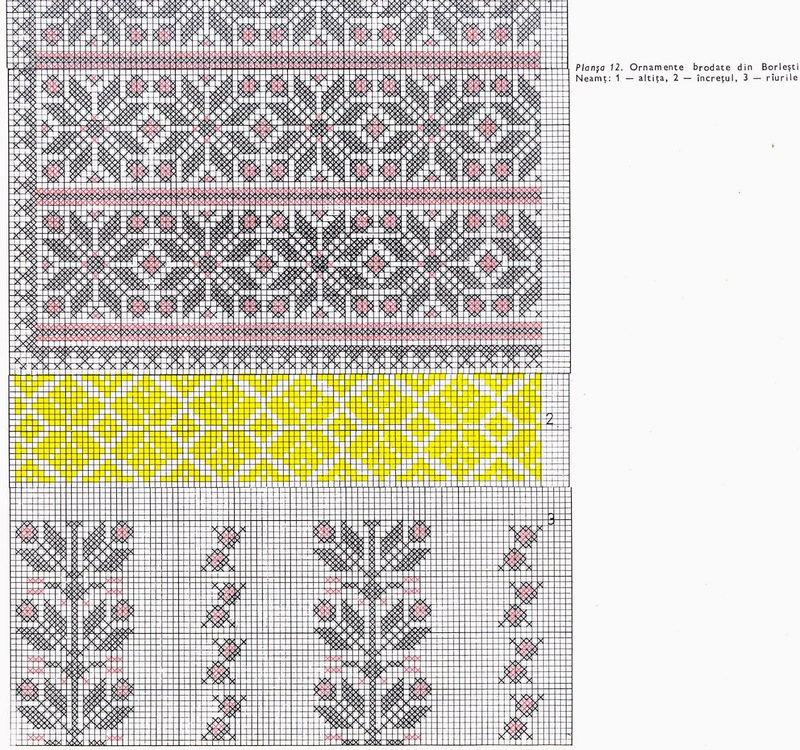 Note that the sleeves have the same three part embroidery as is usual for the larger region. 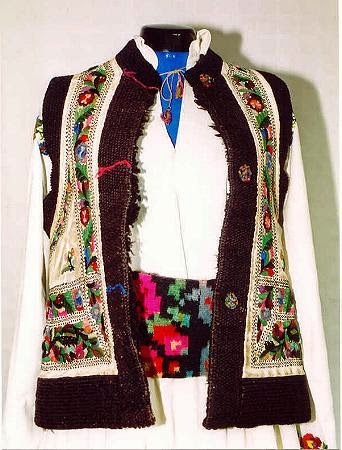 In Romanian, the upper sleeve/shoulder inset embroidery is called altița, the central contrasting band is called încreţul, and the bands on the lower sleeves and body are called râurii. 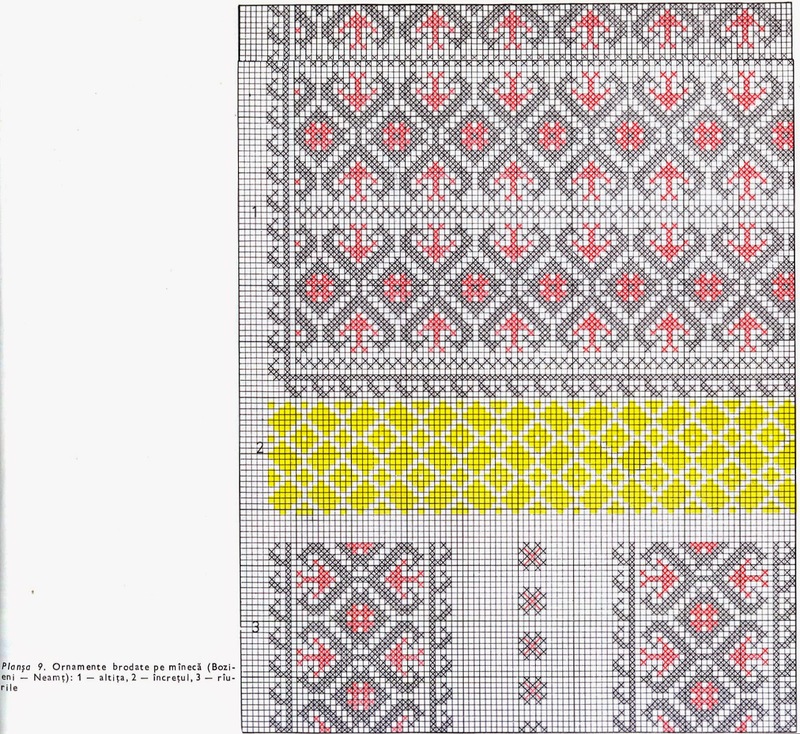 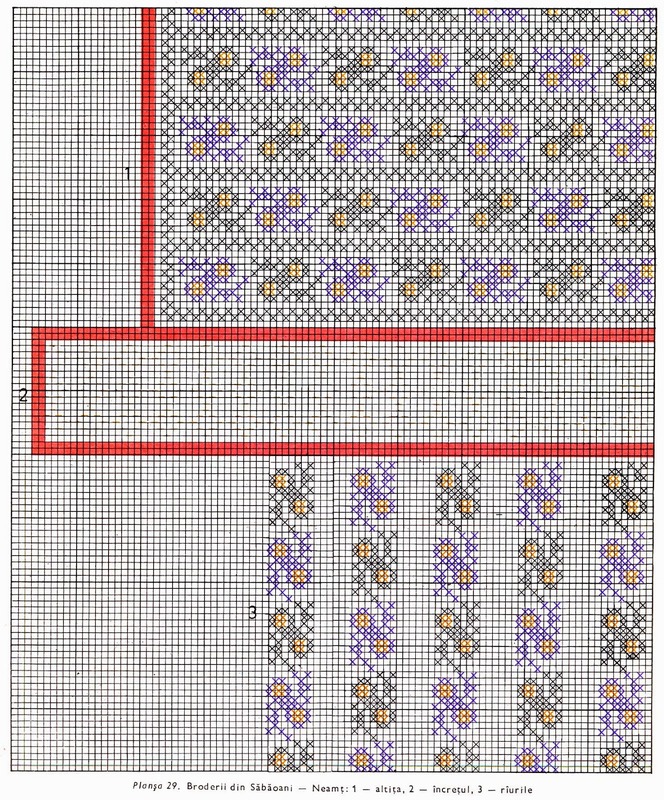 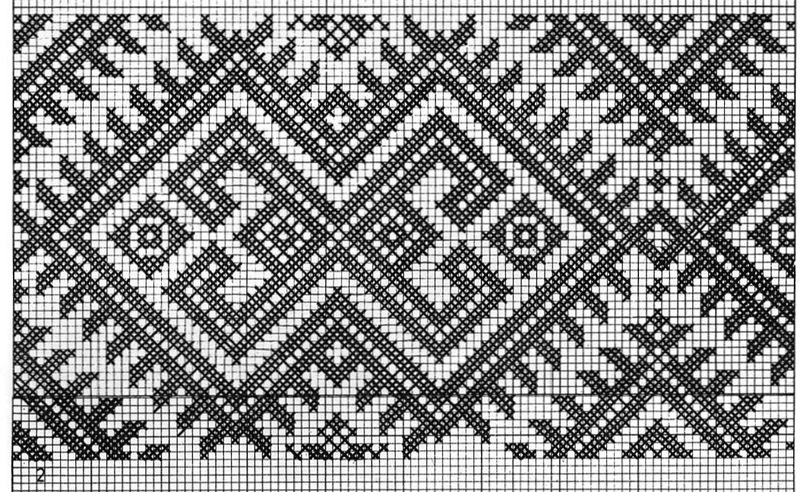 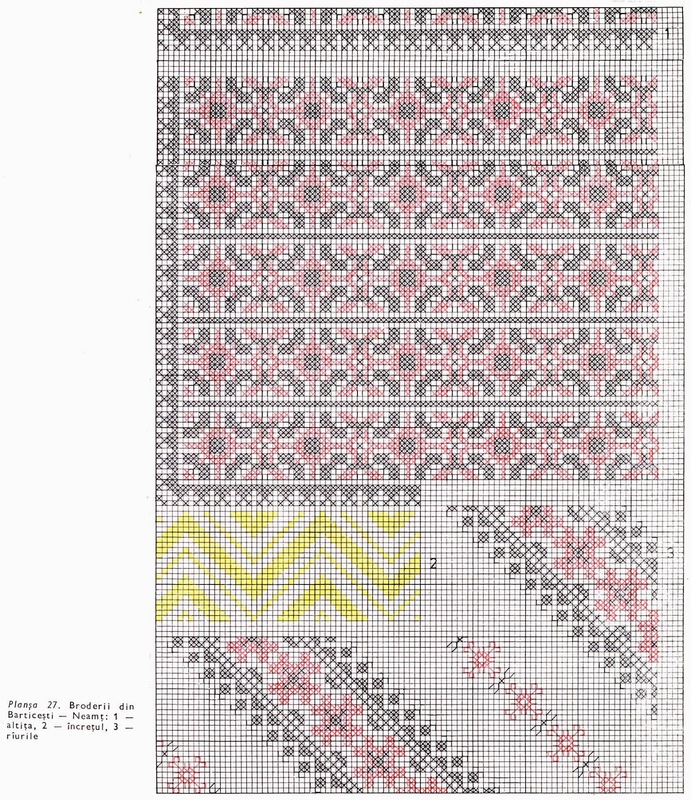 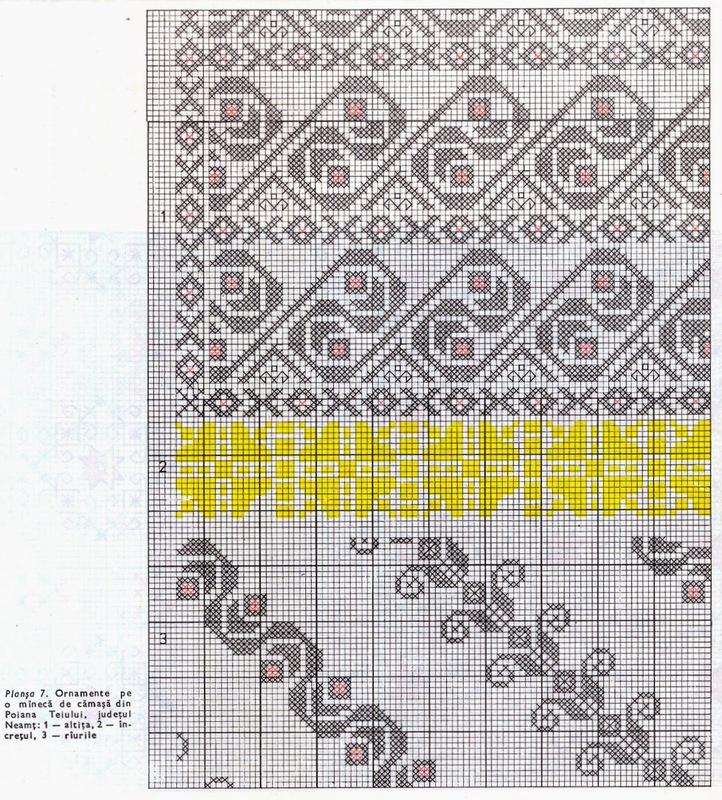 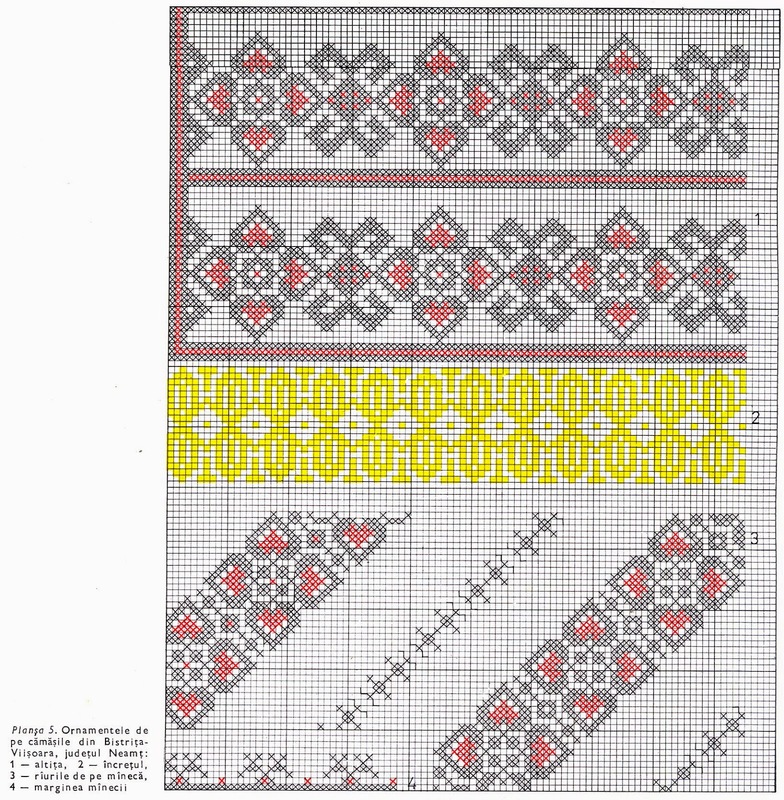 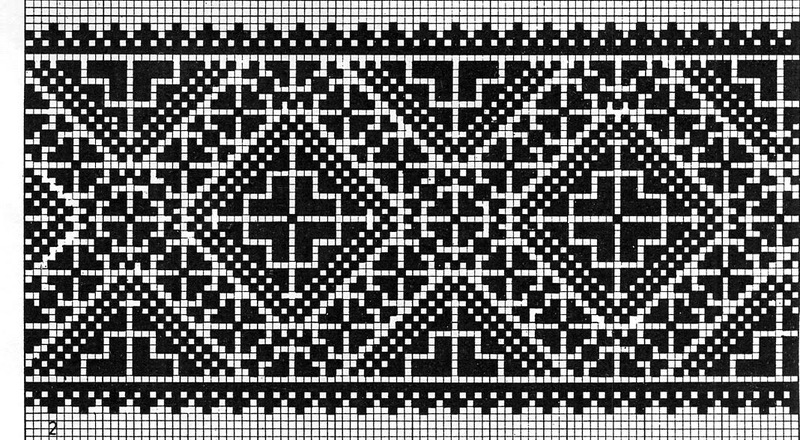 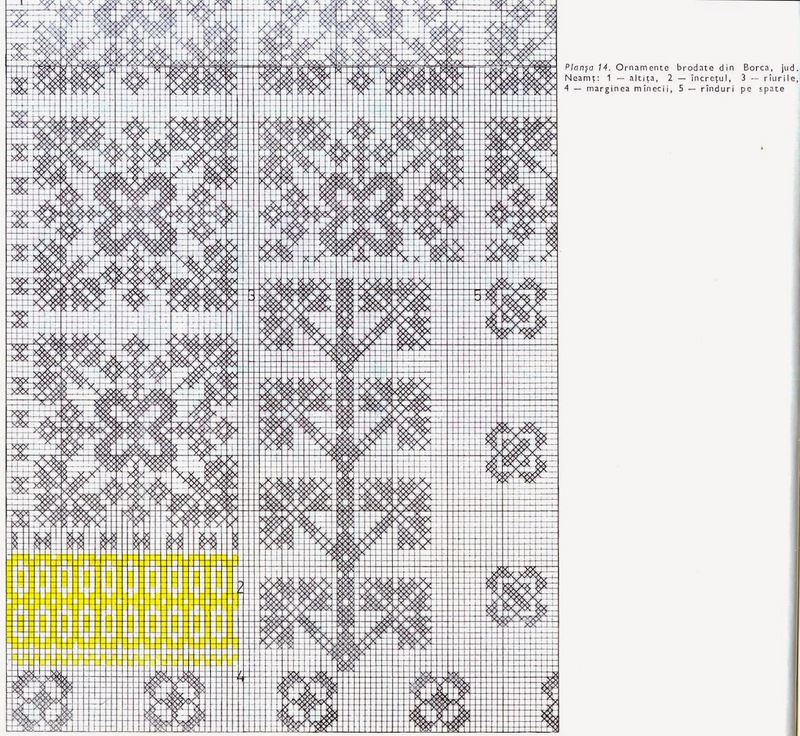 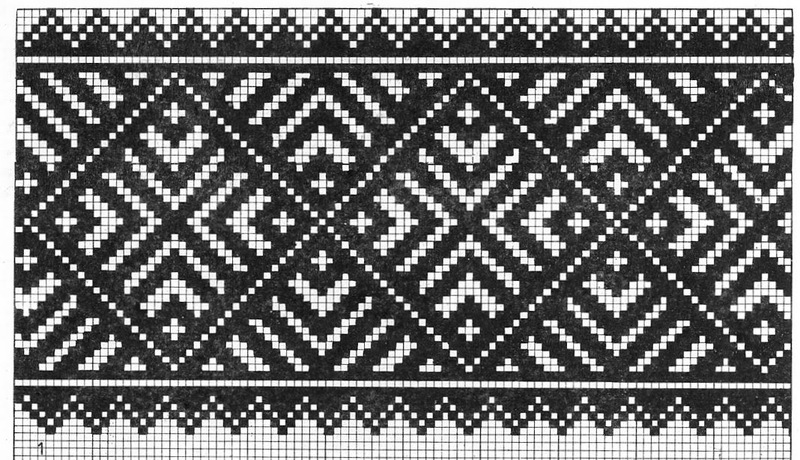 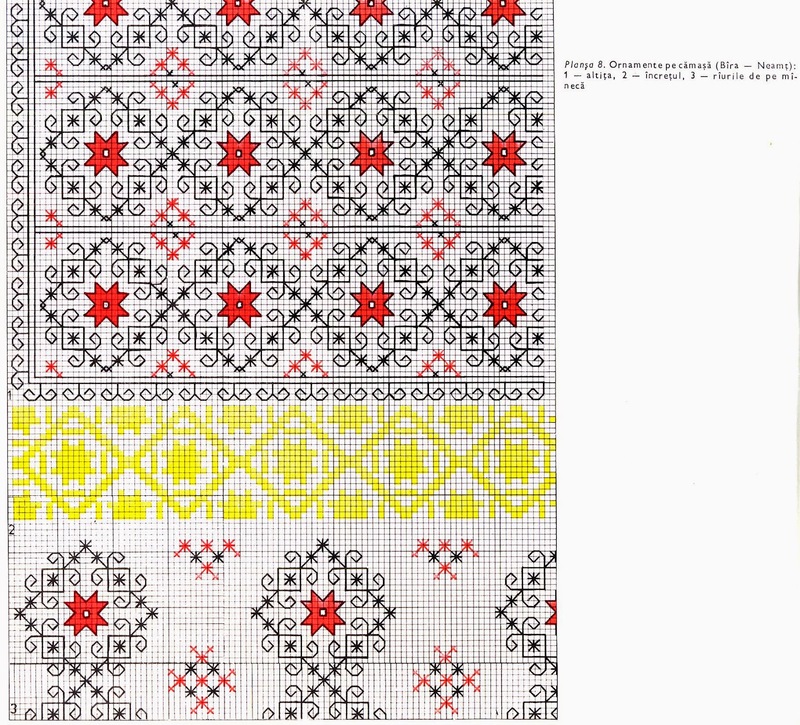 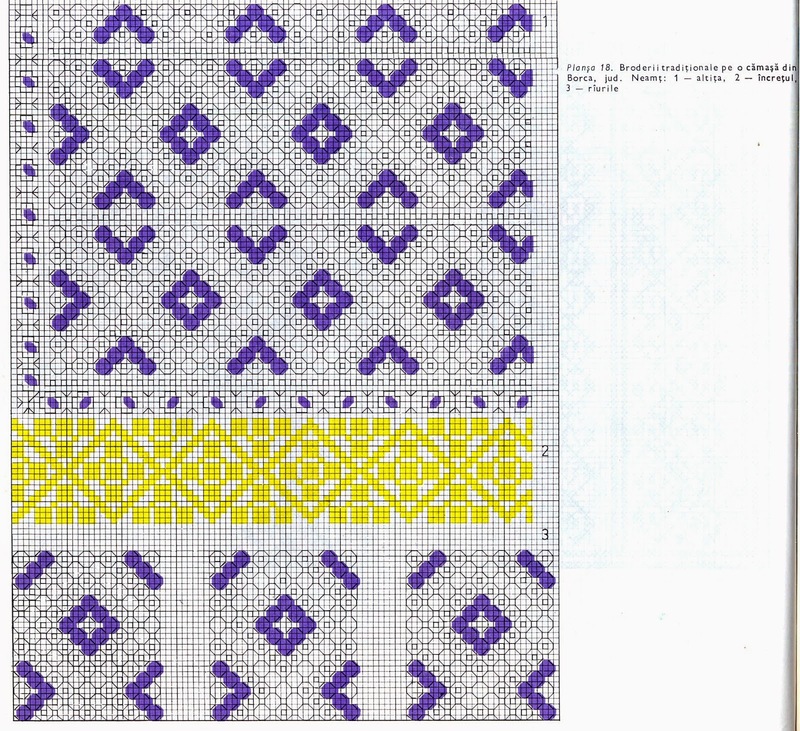 I will close this article with a number of graphed embroidery designs for the ie from Neamț County. 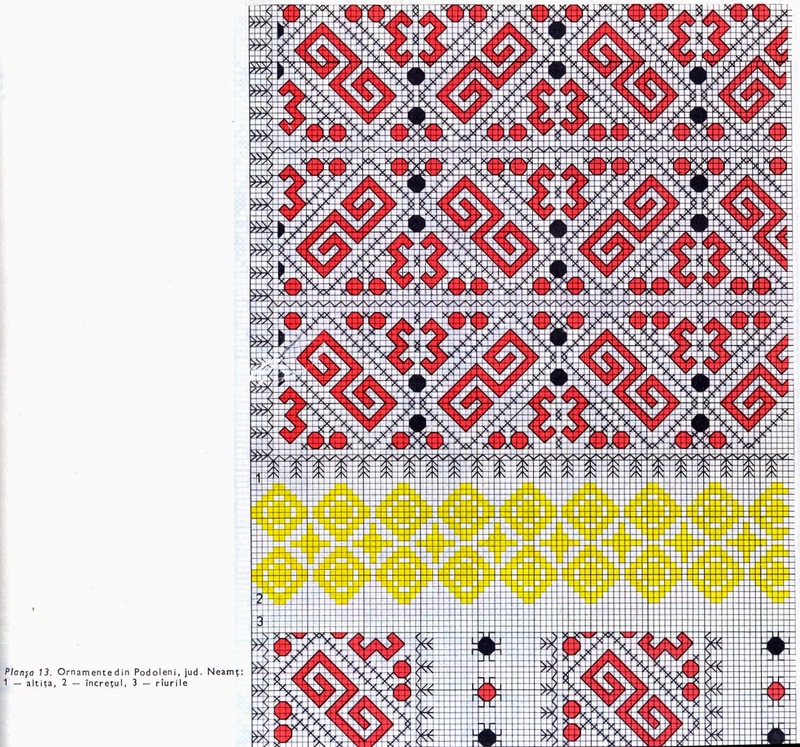 The overskirt is again similar to that used in Bucovina, as you saw in the images above. 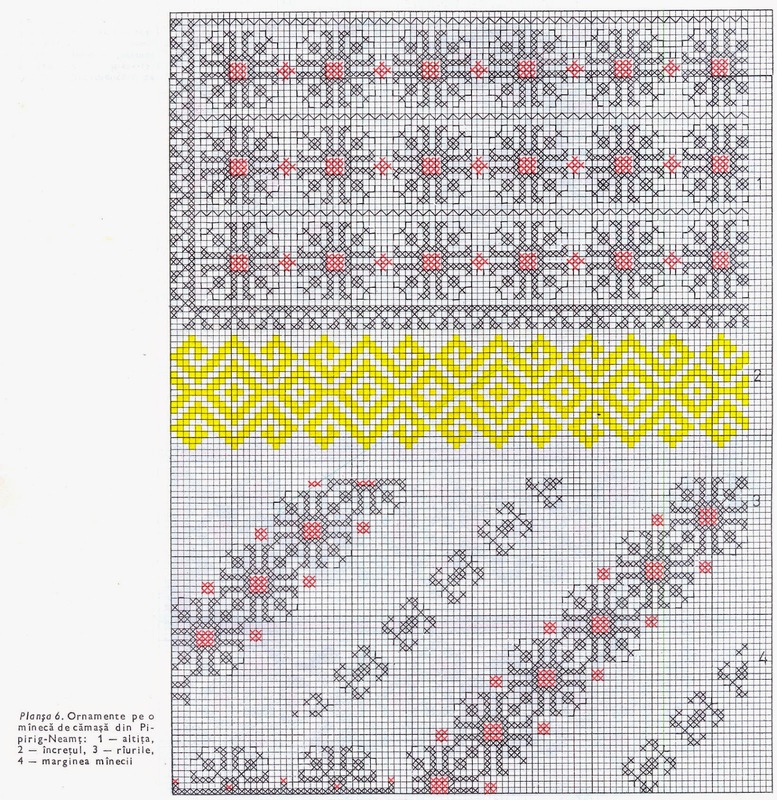 This is a rectangle with stripes woven into both short ends which is wrapped around the hips and secured at the waist. 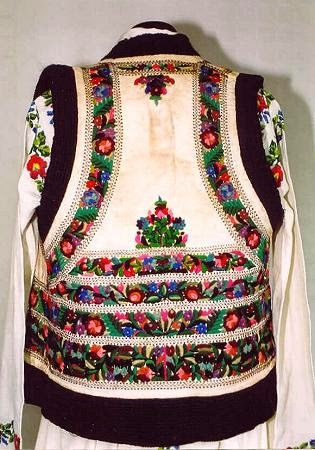 This images is actually from slightly further north, from Cîmpulung, but the costume is much the same, except the embroidery is more elaborate in this image. 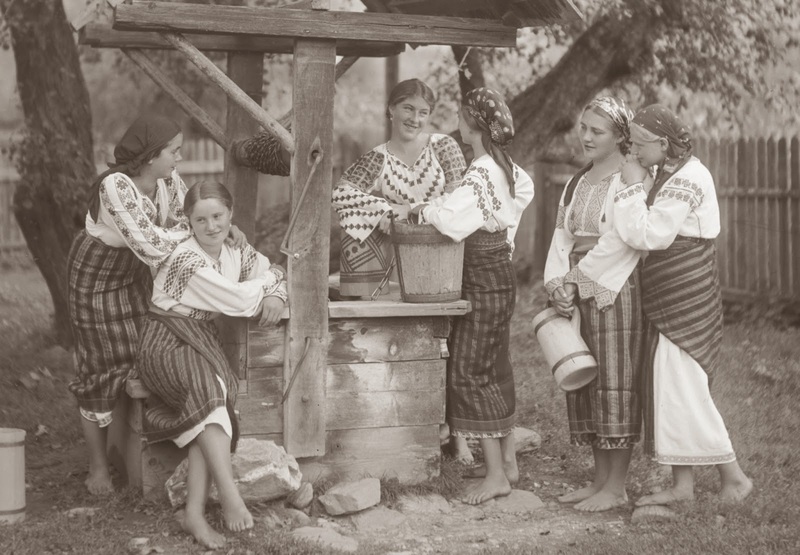 As in Ukraine, the wrap-around skirt was sometimes replaced by a gathered skirt, as in this image. 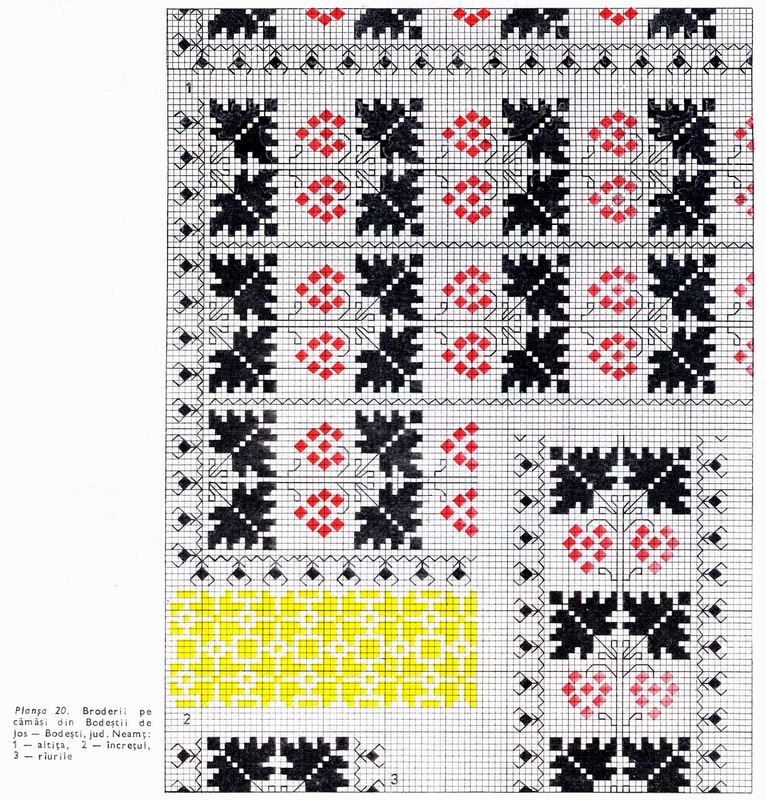 This is not seen much today. 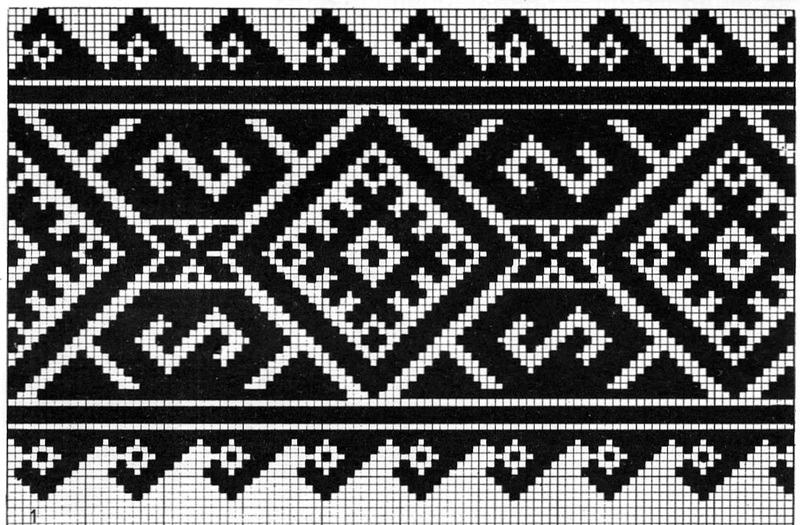 It is more common in Bessarabia. 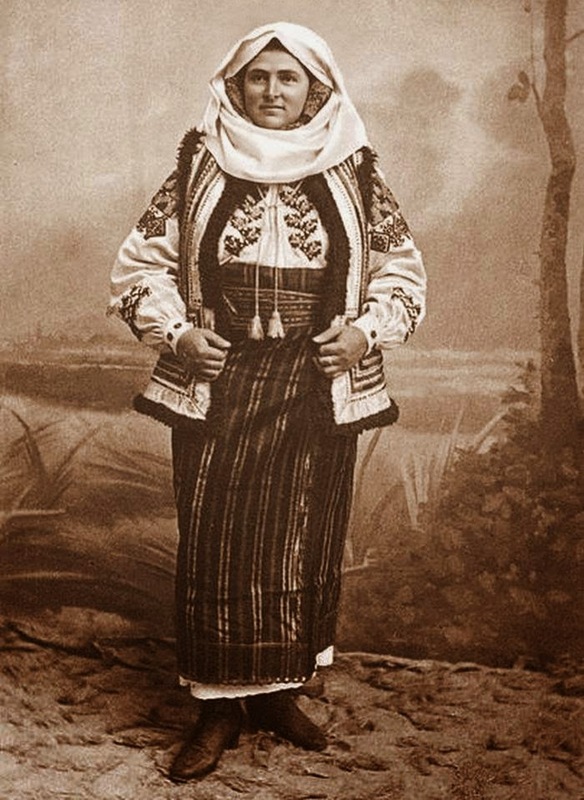 Today the skirts are often worn shorter. 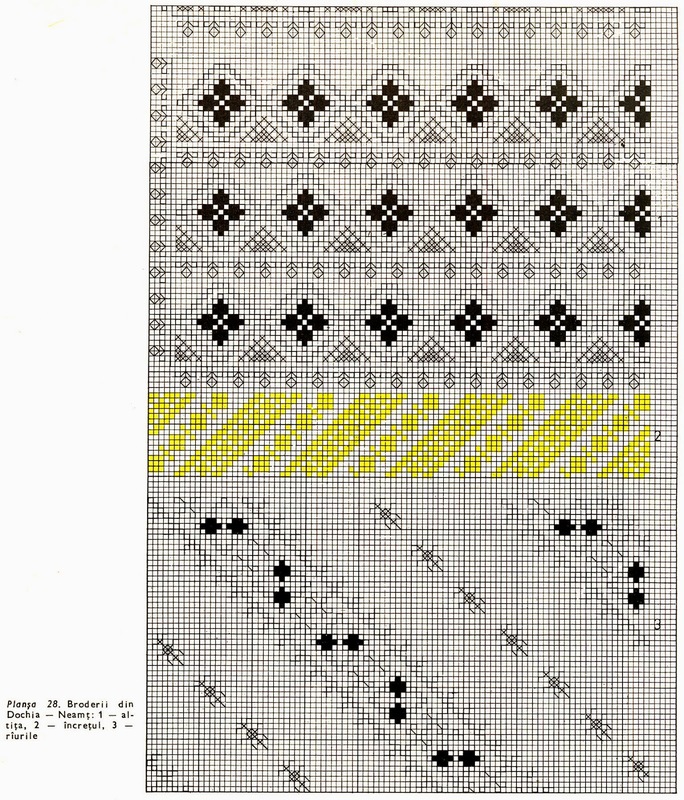 The man's shirt used this cut. 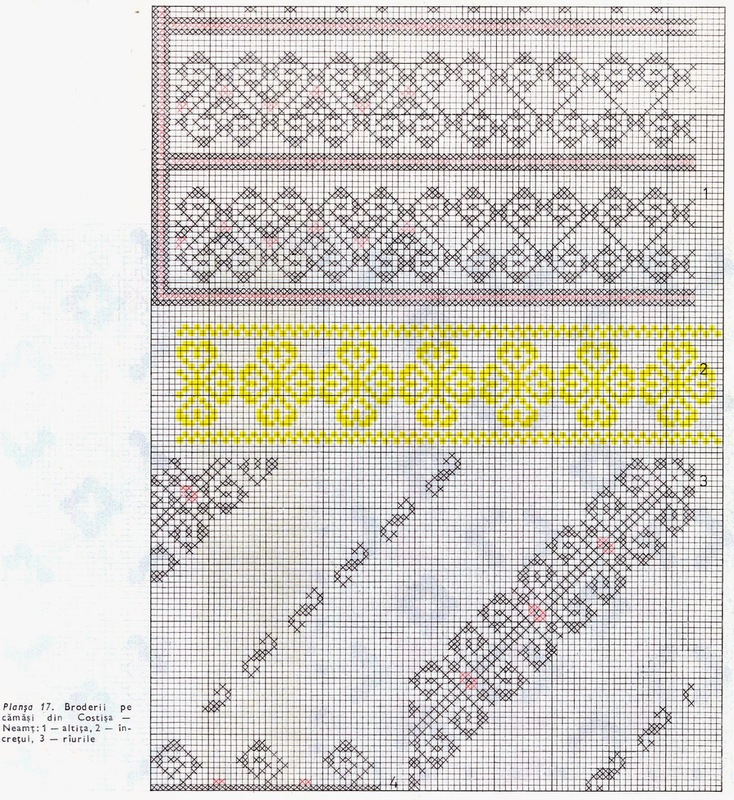 There is basically one embroidery pattern used on all positions on the shirt. 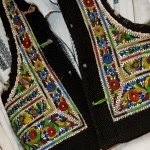 The hem of the shirt is often widened by triangular gussets under the arms. 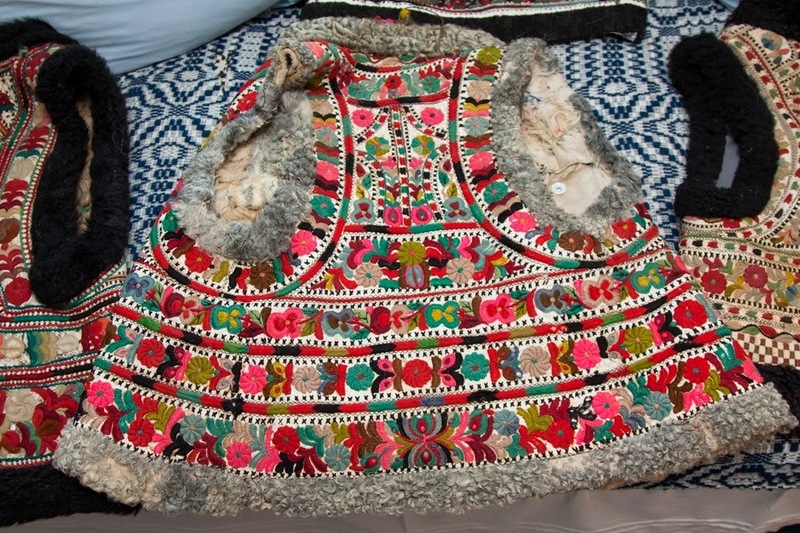 Embroidered sheepskin vests, both hip length and somewhat longer, are worn by both men and women. 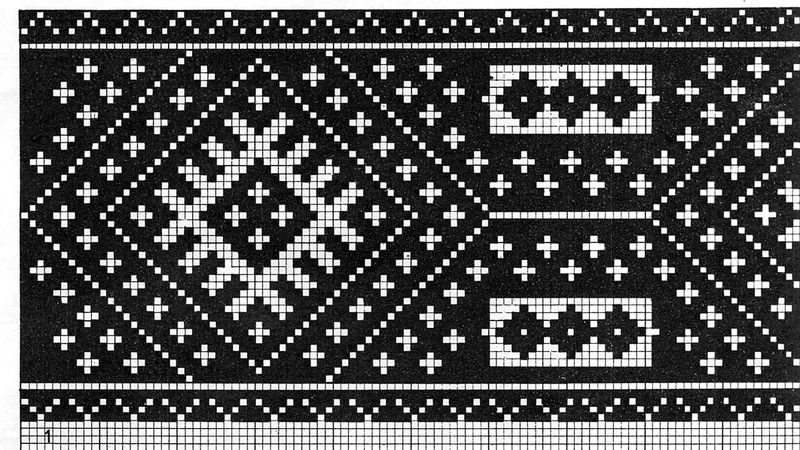 The rest of this article will consist of embroidery designs for both men's tunics and women's chemises from the County of Neamț. 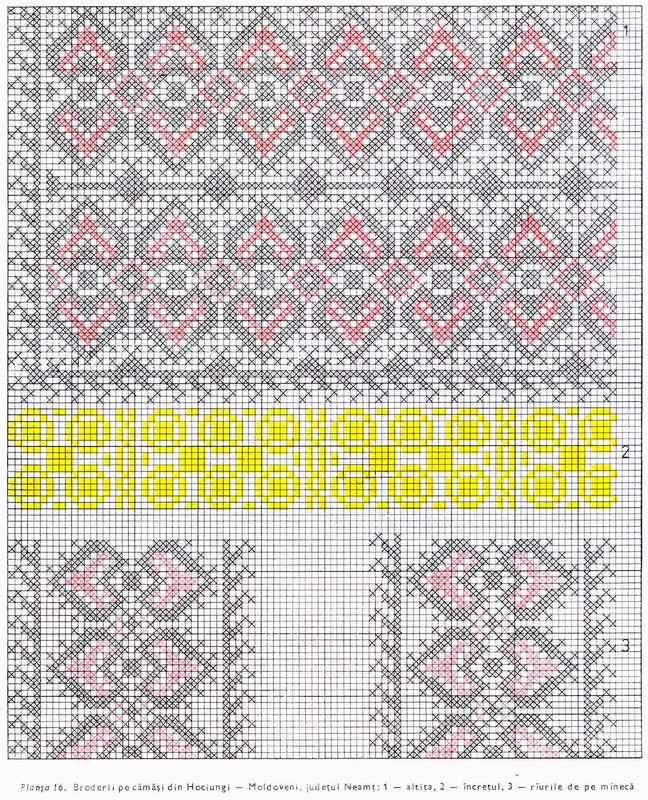 Thank you for reading, I hope that you have found this interesting and inspiring, and will find ways to use these embroidery designs in your own life. 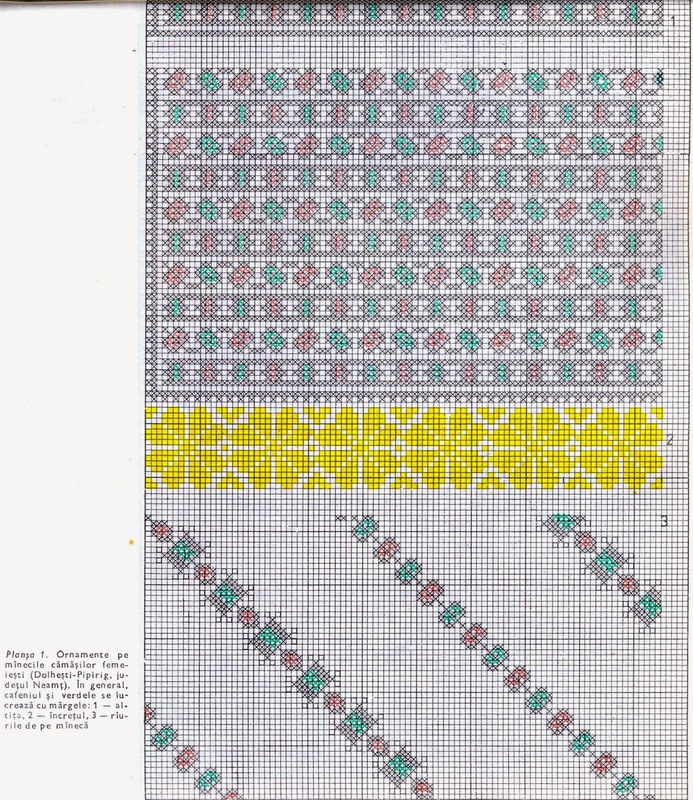 Thank you once again for making all your research available for others to enjoy the results.